There is much debate in our present culture about guns and their role in a peaceful society. The media and the current political administration are working hard to paint a picture of guns as the root of all evil, and they are screaming for greater and greater regulation on the ownership and use of firearms. Here is some information that may help you to draw a different conclusion than the one the media hopes you will draw. A rock, a bat, and a gun are all lying on a table. Which one is a weapon? 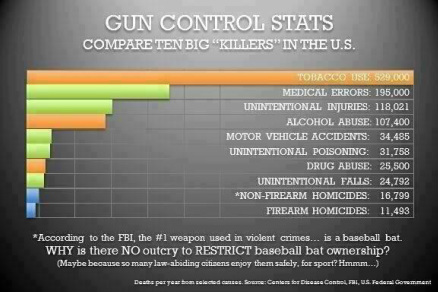 All of them, but no one is talking about banning rocks or bats. The dictionary defines "weapons" as "anything used against an opponent, adversary, or victim." Colorado law (CRS 18-1-901) states: "deadly weapon means any of the following which in the manner it is used or is intended to be used may cause death or serious bodily injury." The list includes: "firearm, whether loaded or unloaded; knife; a bludgeon; or any other weapon, device, instrument, material, or substance, whether animate or inanimate"
The bottom line is that firearms are tools, the same way that baseball bats, hammers, axes, knives, chainsaws and many other items are. All of them are inanimate objects that are equally capable of being used for good as they are for bad. The media routinely refer to firearms as "weapons" to cause people to see them as a source of violence. Our instructors intentionally avoid using the word "weapon" to describe guns, because, in our classes, they are simply tools. Guns have only two enemies - rust and politicians. It's always better to be judged by 12 than carried by 6.
they hear should be the safety clicking off. of a .357 is 1400 feet per second. The most important rule in a gunfight is: Always win - cheat if necessary. 1. If you're not shooting, you should be loading. 3. If you're not movin', you're dead. This is a real sign in Janesville, Wisconsin. Note the fine print which essentially says, "We aren't here to protect you and you can't protect yourself." It's not guns that are the problem, but legislation like this. FBI: Private citizens stopped 16% of all mass shootings between 2000-2012. The results of making gun ownership a requirement. The lowest crime rates in the world are in cities with the most pro-gun laws. Where criminals actually get their firearms. Blows holes in the theory that background checks make a dent in criminal gun ownership. The highest crime rates in the world are in cities with the strictest gun laws. Mass shootings have a long history. It may seem that there is more gun violence in the US in the last 5 years, but in fact, the highest number of mass killings in the US occurred in 1929. Even before guns, lunatics have always found a way to commit murder. Gun free zones are magnets for mass shootings. Criminals target victims who can not defend themselves. The purpose of the Second Amendment was never to permit Americans to own guns solely for hunting. It was to ensure a free society by giving citizens the power and authority to defend themselves against all enemies foreign and domestic. The media and progressive rhetoric suggests that the 2nd amendment's reference to a militia was to ensure the existence of a “formal army”, but this contradicts the exact definition of "militia"